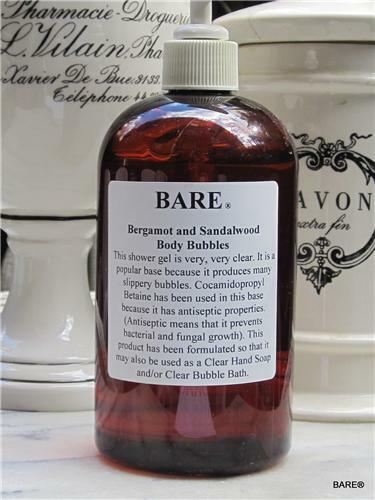 BARE Bergamot & Sandalwood Body Bubbles 16 oz. - This Shower & Bath Gel is very, very clear. It is a popular base because it produces many slippery bubbles. Cocamidopropyl Betaine has been used in this base because it has antiseptic properties. (Antiseptic means that it prevents bacterial and fungal growth). This product has been formulated so that it may also be used as a Clear Hand Soap and/or Clear Bubble Bath.